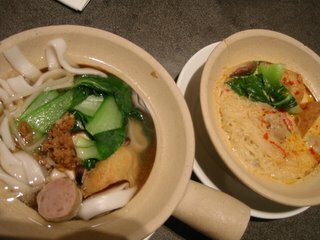 There's only one thing on the menu- and it comes in either a Small (NT$40) or Large bowl (NT$50). How are you going to find it? 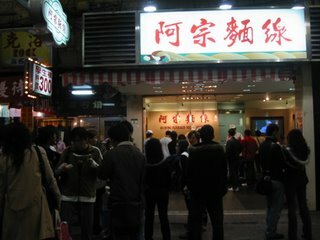 Head to Hsi-Men Ding, wander past the McDonalds and the Watsons and just look for the shop with all the people crowded in front, standing or squatting, slurping their hot bowls of noodle soup. I forget how I first heard about it- it must have been a friend who said I had to try it, or was it seeing the long line of people waiting for their turn? When you get to the front of the line, the chef asks (1) small or big bowl and (2) how spicy? You should also let him know if you want to eat it there or get it to go. The chef skillfully scoops up the right amount and cuts the long noodles with the ladle against the huge pot. And then you get your piping hot bowl of melt-in-your-mouth rice noodles, the thick flavorful soup, and occasional bite of pork intestine. Yes, it sounds not appetizing, but it's actually quite good, and meshes well with the consistency of the soup and noodles. You can even make your noodles more spicy or salty with the mini-station of spices off to the side. 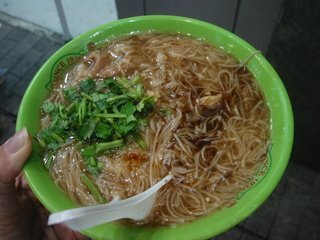 This type of noodle soup is often served with oysters, known as "oyster noodle strand" soup. I've had it in Orange County with squid. Once you have your bowl, you can claim your spot nearby, stand or squat or sit. Once you're done, you put your empty bowl and spoon the bucket with all the others and resume your shopping/sightseeing/workday/fill-in-the-blank. It's fast, it's ultra-cheap, it's filling and it's delicious- the ultimate must-try Taipei experience in a bowl. No.24, Lane 101, Wenlin Rd. The first time we went to Spice Market, I was very impressed with its wide array of mini-stations including a curry bar, a seafood bar, a noodle soup bar, a bbq meat bar, appetizer and salad bars, and a dessert bar; its earthy, pretty and clean decor with lots of cherry woods and Asian-inspired designs and variations in seating; but most of all with the spring rolls- they were crisp, freshly made and satisfying. 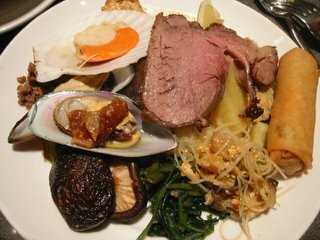 I was very excited to come back- after all, I barely skimmed the surface of the buffet and left stuffed. When you enter, there are rows of tables for parties of 2-4 with the typical wooden tables and chairs, but off to the right, there are mini-patio style seating areas with cushions, each with its own area for larger parties where you see a lot of families. When you turn the corner, there is a very long row of food, with hot foods to one side and drinks and desserts to the other side. Everything is self serve, including the drinks, but they are pretty timely about whisking away your dishes. 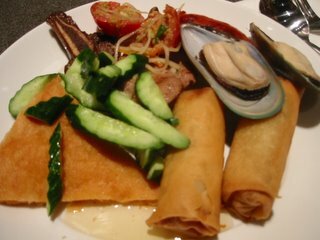 As I wasn't allowed to take pictures of the buffet area, you'll have to see the food from my plate. Spice Market has a lot of the popular fare- such as crispy spring rolls and shrimp cakes, the triangle shaped deep fried appetizers, as well as some stir fry vegetables of different variations. 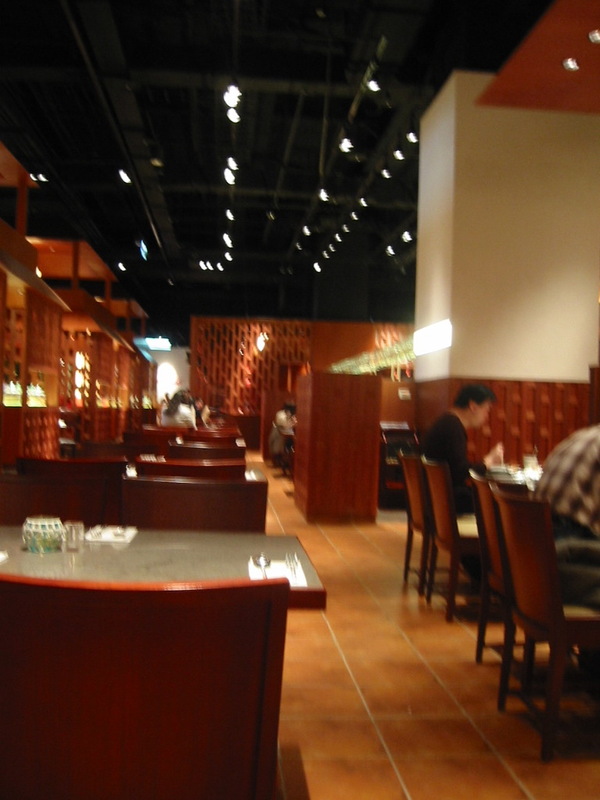 I liked that they seemed to refresh the areas often, perhaps because they kept the heat-lamp bowls smaller than typical trays of food, so that the food didn't sit out as long. But I liked the result- unbuffet-like hot and crispy eggrolls and vegetables that weren't soggy from sitting out too long. The seafood bar at the end of the long buffet row had piles of crab, shrimp and mussels, for which I just sampled the mussels. True seafood buffet lovers might opt to get their hands dirty and dig into the shellfish. I went instead for the bbq meat station, which on my first trip featured very tender and delicious chicken, beef and lamb. On my second trip, the meats looked like they had been sitting out longer than they should. Perhaps because we were there during the last hour of the dinner buffet and not during the height of lunch? I don't know if I had requested to the bbq guy if he would have made me some fresh bbq grill. 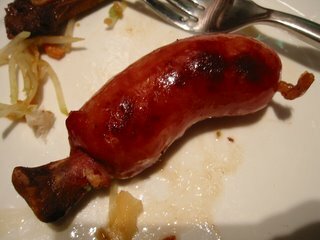 Anyways, the thing that I did not like from the grill was this mysterious sausage on a bone- but it was not really a real part of a distinguishable animal and it tasted like it had been cobbled together. It might be a fun treat for kids, but not for me. I would rather eat a corn dog for my mystery meat quota. Not a part of the bbq meat area, is a lone Thai prime rib station at the end, with pre-sliced portions. It looked promising, but the meat was a little tough and bland for prime rib. I was disappointed with it both times I visited. Taste wise, my favorite hot dish was probably the noodle soup station. You can point to the vegetables, mushrooms, meatballs or noodles you want, or ask the Chef to decide for you, to get a hot, customized noodle soup. You can choose from a wide white rice noodle, an egg noodle, or a clear thin rice noodle as well as two different soups- a clear chicken broth or a spicier curry soup. I really enjoyed the taste of the chicken broth with the chewy wider rice noodle. In Chinese, a noodle that is "just right" is very "Q"- the right amount of chewy-ness, sort of like pasta when it's al dente. The noodles there were surprisingly Q. The curry station featured 5-6 different curries with different meats- chicken, beef, pork and three kinds of rice- white rice, Thai black rice and a curry rice. I found the tastes of the different curries to be very similar and each packed a little bit of heat. I was disappointed that the only other thing in each curry and meat were huge chunks of potato- no other vegetables or bamboo. The dessert station featured fruit, lots of little cakes, an area where you could put together your own jellies, tapiocas, beans or fruit into your own soupy dessert (similar to toppings you would see for shaved ice without the ice or Filipino halo halo drinks) and a Movenpick ice cream freezer, with sugar cones and chocolate and strawberry syrups on the side. You can even choose your own drink with their small silver cups- with a fountain featuring Calpis, Rose and Fruit Ice Tea, Mango juice or Thai Ice Tea. 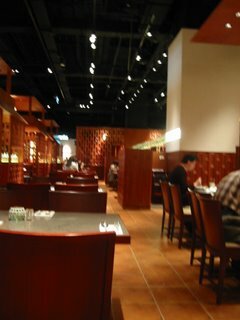 The second time I went to Spice Market, I still devoured the spring rolls, the noodle soup bar and the desserts. I just felt that the level of "wow a buffet that has food that seems made to order freshness" was not the same, especially for the meat bbq station. As with any buffet- Spice Market offers eaters a chance to sample and choose from a huge variety of foods that they typically wouldn't be able to order in one sitting as an individual or couple. On my second trip, I found myself wishing they had other Thai favorites like Pad Thai or Pad See Yew or Pineapple Fried Rice, but I could also see why a buffet would choose not to have sticky noodles that wouldn't sit out well. So I definitely recommend that one could try Spice Market at least once, perhaps for lunch, because you will definitely come away full.